With a knife, spread some peanut butter on one slice of bread and add your favorite mermelada on top- we like apricot jam best. Open a can of chipotle peppers in adobo sauce and take out one whole pepper. Split it open and remove the seeds. With the help of a fork, mash the pepper well. Then spread a little of the mashed pepper onto another slice of bread. Combine the two halves to form a sandwich, and enjoy with a cold glass of milk. You can mix the chipotle pepper directly into the jam, so you’ll always have some at hand, ready to serve. 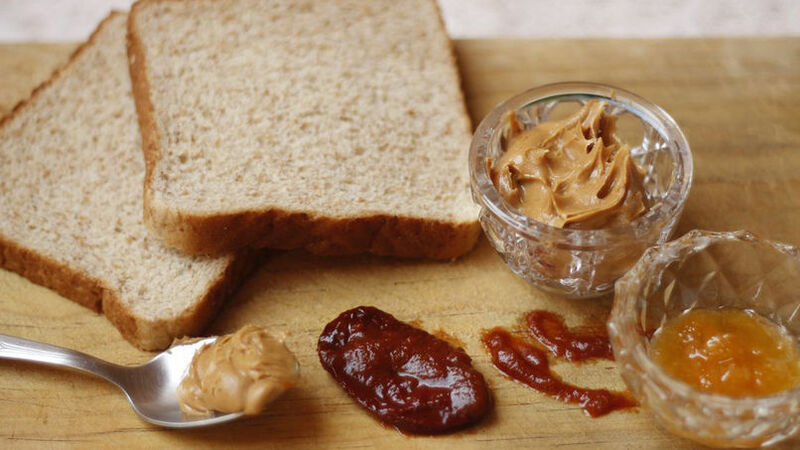 If you like a warm PB&J, toast the slices of bread before spreading with peanut butter. Peanut butter and jelly sandwich, or PB&J, is a favorite snack among many kids and adults. My mother usually gave me toast spread with peanut butter when I was little. After arriving to the States, I was completely surprised to see that jelly was added to the sandwich! After my first taste, I was hopelessly in love with its sabor. Now that I have children of my own, PB&J is a lifesaver when they are hungry and there isn’t much time to prepare a tasty snack. One day, my oldest child and my husband decided that it was time to make a new kind of PB&J, and immediately started rummaging through the pantry and the fridge to see what we had available. Chipotle peppers in adobo sauce are never missing in our house because we love their smoky and spicy flavor. Since my son loves chili peppers, he decided that this would be the new ingredient to combine with PB&J. The new combination turned out to be such a success that my husband and son have continued to prepare it. It’s a very simple recipe that’s full of flavor. Do you dare to try it?